Now that Bluemix has started support for Kubernetes, let's go through what it takes to convert docker-compose files into YAML and build your containers. Orchestrate away! Since last month, Bluemix has started to support Kubernetes (beta), which many people consider the de-facto standard for container orchestration. Some of the older and simpler Bluemix sample applications use docker-compose. Below is a description of how to run those examples on Kubernetes. Essentially, the docker-compose file needs to be converted to a Kubernetes YAML file. For example, I use the chat application BlueChatter. The sample is a Node.js application that leverages Redis to store session data. The file docker-compose.yml defines the two containers: the ports and links. In order to create the Kubernetes configuration file, I’ve tried an open source project Kompose (Kubernetes + Compose). When you run it, four files are created, two for the deployments and two for the services. For a quick introduction to these terms, watch this video. I’ve merged everything into one file. There were only two things I had to manually change in the file. In order to expose the web application via a public IP address, I defined a public port for the ‘web’ service via NodePort. 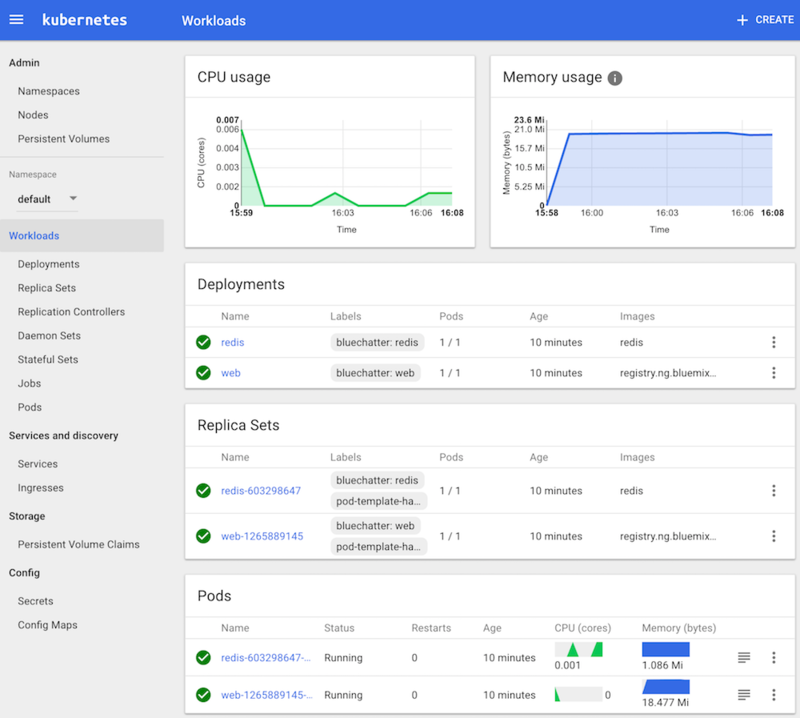 Here is a screenshot of the Kubernetes dashboard. Here is the Kubernetes file ‘bluechatter.yaml’. Run these commands to create and configure a cluster. Run these commands to build the containers of the sample. Run these commands to deploy the sample application.